The luxury waterfront hotel is located beside the Canada Place Cruise Ship Terminal, and is within walking distance from Stanley Park and Gastown. 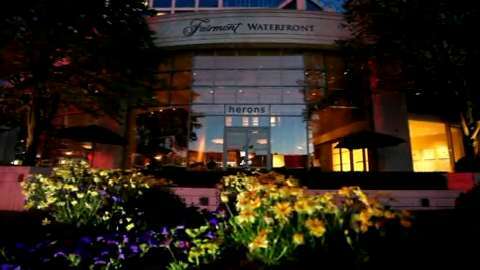 The Fairmont Waterfront Hotel, Vancouver showcases the best of Vancouver. Connected to a diverse selection of restaurants and retail, and conveniently situated beside the Canada Place Cruise Ship Terminal, the luxury Vancouver hotel has a central location ideal for any stay. The 489 hotel rooms are spacious, elegantly appointed with distinctive amenities and showcase spectacular city, mountain and harbour views through floor-to-ceiling windows. Try the guided morning runs, visit the roof-top herb garden or let the urban resort inspire you to explore Vancouver in unique ways. Set out on foot to discover trendy eateries in historic Gastown, Robson Street shops, stroll the Seawall and Stanley Park, or experience a bird's eye view of this spectacular city by helicopter or floatplane. At the Fairmont Waterfront, spacious, elegant and contemporary accommodations in Vancouver will satisfy the most discriminating guest. Over 300 of the 489 guest rooms overlook the harbor, offering spectacular views of the majestic mountain peaks. The other accommodations have splendid city skyline views of Vancouver, and overlook the hotels third-floor herb garden. With thoughtful refinements uniquely suited to your personal and business needs, and warm welcoming service, The Fairmont Waterfront's accommodations in Vancouver exceed all expectations. The Fairmont Waterfront is pleased to offer wireless high speed internet access in all guestrooms, a feature that is complimentary for Fairmont President's Club members, along with many other benefits. The downtown Vancouver hotel offers four categories of regular guest accommodations as well as a selection of suites and specialty rooms. All guest rooms and suites feature floor-to-ceiling windows to highlight the beautiful scenery that surrounds the Fairmont Waterfront. Guests seeking the ultimate in service and luxury will relish accommodations on the recently renovated Fairmont Gold, the hotel's exclusive concierge floor, featuring private check-in and lounge, continental breakfast and afternoon canapés. Offering a leisurely dining atmosphere in a bright and airy setting, Herons West Coast Kitchen + Bar features views of the Vancouver harbor and North Shore Mountains. Located on the edge of the downtown business district, this Vancouver waterfront restaurant is conveniently situated across from the Vancouver Convention Centre and Canada Place Cruise Ship Terminal. The culinary team at Herons West Coast Kitchen + Bar embrace fresh, local and sustainable ingredients complemented by hotel-grown herbs from the 2,100 square foot rooftop garden and honey from the on-site honeybee colony. Expect simple, flavor focused cuisine, cooked with flawless execution appealing to discerning or emerging palates. This central Vancouver waterfront restaurant is the perfect setting to connect for business or pleasure, a leisurely lunch or a post-meeting cocktail. The hotel is ideally set for meetings and events with venues that feature natural light, dedicated boardrooms, upscale hospitality suites, private terraces and our magnificent Waterfront ballroom. Whether an executive meeting for 10 or a professional conference for 788, they make certain everything you need is at your fingertips. Linked to a concourse of shops and an enclosed walkway to the Vancouver Convention Centre and Canada Place Cruise Ship Terminal, the Fairmont Waterfront hotel is as functional as it is elegant. Down-time activities abound - sightseeing, shopping in historic Gastown, a jog through Stanley Park, golf, whale watching or skiing. In short, the Fairmont Waterfront has everything you need to ensure that your meetings run efficiently while delegates are enthralled by the stunning scenery.